One of New Belgium's Winter seasonals (along with 2° Below), Frambozen is New Belgium's take on the Framboise style. 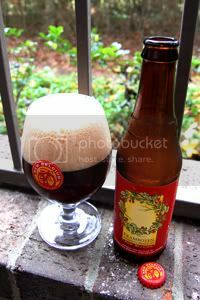 According to the late beer scholar, Michael Jackson, the Framboise style is a "[r]aspberry beer, usually based on Lambic." This particular example is constructed by mixing fresh red raspberries into a Brown Ale. Regarding the berries, according to the brewery: "Every year, New Belgium sends a delegate to the Pacific Northwest to oversee the process of turning freshly picked berries into a pure juice to be added in fermentation." Apparently, the Serbian raspberry crop failed this year. As it's the world's largest, raspberry prices are up across the board. Accordingly, you might find that this year's Frambozen six-pack commands a dollar or so premium over last year's. But, with the hop shortage driving beer prices up everywhere, you probably wouldn't have noticed the difference anyway. Appearance: A thick, dark burnt-umber body with ruby highlights. A huge, bubbly, off-white head with a rose tinge sits on top and leaves good lacing. Aroma: There's certainly no doubt that this beer is infused with fruit. It reminds me of a good crisp grape juice with a bit of Ribena blackcurrant mixed in. Not much as far as hops or malt come through. This is intriguing, to say the least. Taste: Tart, gushy berries mixed with a somewhat subdued roasted malt. If you go looking for the malt and alcohol, you can certainly find them underneath the fruit, but I'm not really picking up any hops here. Grape makes a bit or a return and, in a bizarre way, makes the beer remind me of red wine at times. You might think all of these flavors wouldn't mesh, but they actually come together pretty well. This tastes like an adventurous homebrew, not that that's a bad thing. The aftertaste cranks the malt up a notch or two and loses most of the raspberry. Mouthfeel: Light-to-medium body with lots of carbonation and a nice dryish finish. Drinkability: While it goes down easily enough, and only clocks in at 6.5% ABV, I still probably wouldn't want to be drinking these all night. Interesting and pleasant enough, but more fitting for a glass or two than a full session. Verdict: Frambozen is a solid and unique fruit beer; nothing more, nothing less. A nice change of pace as far as holiday seasonals go, there's a good chance that I'll be picking up another six-pack of this next winter.